The first step is to get an affiliate account with this Company. They are the only Company to provide MFC affiliate accounts. It is 100% free and only takes a few seconds to join. Once approved you will be able to navigate to their ‘offers’ tab. From there you need to use the search bar and type in ‘myfreecams’. Then click on the offers. You will see they offer a few different offers for MFC. There are offers for per sign up of $2.50 for tier 1 (T1) traffic. This is traffic from countries like United States. You are always much better off selecting ‘revshare lifetime’. This will pay you 20% commission for all money spend on MFC that joins through your link traffic referrals. This adds up to large amounts of $$’s very quickly and cam make actually working on cam seem a waste of time 🙂 You may find that you need to be approved for using ‘revshare’. If this is the case just click the apply button and write that you will be sending at least 30 clicks a day by way of your fans traffic for your social media accounts. If there are any dramas with this just message them and ask what they want in order to approve you for the offer. We have had a few girls not trusting this guide and they have called it a scam. 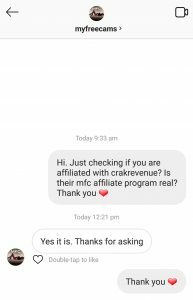 We have messaged MyFreeCams on Instagram to provide you with proof that this program is real and legit. What Do You Do With The Link? Well, there are a couple of different options. The first is just using that big long ugly looking link and sharing it everywhere you can. This doesn’t convert the best as it looks ugly and most people would rather click shorter ‘cleaner’ looking links. The second option is by using Bitly or one of the other ‘link shortner’ sites you will find from google to make the link look more ‘pretty’. Some of these link shortners will even allow you to customize the wording of your link so it looks great. Keep in mind some people use these link shortners to then spam links so some shortners might not like you using their service or they will put up a warning page when someone clicks on your link. If this happens try another link shortner site, as a warning page will greatly reduce conversions. The last and best option, we feel is to purchase a custom domain and redirect it to your link. Note, when you select your affiliate link it is best to use the drop down ‘model’ tab and at the end of the link just add ‘&model=hotgirl’ where hotgirl is your actual cam name. This will mean when someone goes to that link they land on your cam page and not just the MFC homepage. How To Make A Custom Domain Name. Now you ask, “how do you make a custom domain and redirect it to your offer?” The best way to do this is to just go here and chose a good domain name. From there you just need to purchase the domain name and make sure you click the ‘private registration’ tab. Make sure you purchase ‘domain only’ and NOT hosting. Once your domain name has been issued (you will get an email) you can just log in and click ‘redirect the domain’ and enter your MFC affiliate link as per the above. It is best that you follow this guide to show you how to redirect your domain step by step. Once that is done you can just share your custom domain name everywhere and start earning $$’s. If after looking at that guide you find yourself overwhelmed and don’t understand what it all means you can contact us and we will help you, or for just $20 a year we can purchase a custom domain and set up the redirection to your affiliate link for you. All we require you to do is to go here and pick a great domain name that is available and then let us know and make sure you have joined this affiliate program as you will need to provide us with your MFC affiliate link to redirect to. Another supplementary benefit of using a custom domain is that if MFC ever closes down or you wish to use another Company you can just redirect your domain to the new Company. That way you effectively keep and own all your domains traffic. This is basically like goodwill for your online business as traffic = $$’s. Good luck, and please let us know if you find this guide helpful as we are sure you will.